UCL Champions League Semi Final Analysis 2014-2015: Real Madrid will face Juventus and Barcelona will face Bayern Munich next week. Match details here. With the UEFA Champions League draws complete, we are now all set to experience once again the thrilling encounters between the big four. The best of the best teams of Europe are now face to face. Only one of them will be the champion of Europe. We will take a look at them, their chances and statistics so far in the title race but before that let’s take a look at what these semis have to say to us. Once again no team from the English Premier League. Well that’s a sad story. It seems like we are getting used to it. It will now again be a non-EPL semifinal. The league which declares itself to be the best in the world has once again failed to qualify for the UCL semis. Surprisingly no English team qualified for the quarters too this season. The flag bearers who were Chelsea, Manchester City, Arsenal and Liverpool were all knocked out before quarter finals with Arsenal beaten by AS Monaco, Chelsea by PSG and Manchester City by Barcelona while Liverpool were knocked out in the group stages. 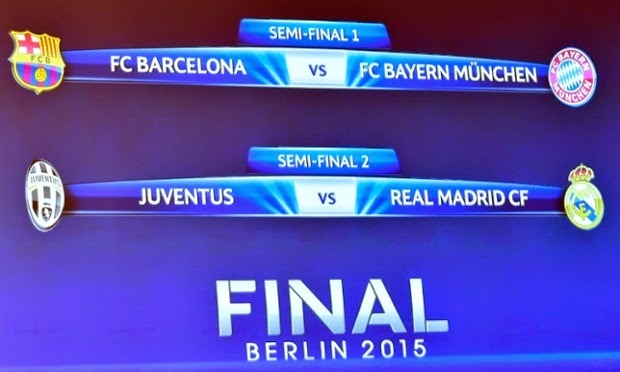 Once again Real Madrid and Barcelona qualified for the semis. The Spanish giants have become a vital part of UCL semis with at least one of them qualifies for semifinals every year which also marks the era of supremacy of Spanish football. Having equipped with best players from all over the world these two teams are almost impossible to be knocked out until they face each other. One of the major contenders and possible winners of UCL, 4 times UCL winner Barcelona name doesn’t require any introduction. Regarded as one of the best teams across the globe. Barcelona title chances are very high having not won the title since 2011 when they defeated Manchester United in the final. Los Cules will now be more hungry to get their hands on that piece of silver now when they are back with the world’s best strike force they can be very dangerous when it comes to goal scoring. The most interesting team to watch will surely be no other than Juventus because of the fact that they indeed qualified for the semis after 12 years having not qualified for semis since 2003. Having won the UCL two times the old lady will be looking to add another trophy to their trophy cabinet. It will be a great opportunity for Italian giants to revive Italian football and lift the trophy as champions of Europe. The chances are good for them as they are equipped with one of the best midfielders in town namely Andrea Pirlo, Paul Pogba and Arturo Vidal. One the most brilliant teams to ever play UCL, the legendary Real Madrid is surely one big title contender. Having won the UCL title recently in 2014, the Los Blancos have won the competition for a record 10 times and are now most fearsome as ever with one of the best players like Cristiano Ronaldo, Gareth Bale, Luka Modric andToni Kroos at their expense. The Los Blancos are almost vulnerable to defeat having qualifying most times for the championship. They surely are a great team to look out for. With Bayern Munich comes with a variety of outstanding players combined together in under the same roof having an outstanding gameplay. Bayern Munich too have won the title recently and will surely be looking to add more silverware to their trophy cabinet. The 5 times Champions League winner Bayern will be a great force to watch in the Champions League.